Getting ICS on Kindle Fire has been the long standing dream of many Kindle users . While there was earlier news that an XDA Developer’s member, nicknamed g1011999 was working on an ICS port (which is yet to be completed), this feat has now been achieved by another member, JackpotClavin. He has just released a very experimental build of ICS. This is mainly a raw build and therefore it must be used with extreme caution. Users who may not have any experience in flashing custom ROMs on a Kindle device should avoid using this ROM. The initial reaction at XDA-Developer’s forum seems to be a mixed one, as some components of this ROM appear to be dysfunctional, at least for certain users. According to a comment at XDA Developers forum, there has been a complaint about issues with video playback for Netflix and some audio problems with Angry Birds. Another member also complained that he has been facing random spouts of sound and sometimes the keyboard begins making key noises. He too was facing problems while playing Angry Birds. On a positive note, the Wi-Fi seems to be working fine and details are coming in at XDA about what (currently) works and what does not. As this was primarily meant to be a Developer’s build, therefore, such issues are expected. Having said that, as this is a raw build, issues like the ones mentioned above will hopefully be resolved, as new updates are made available. According to the developer “Use Trebuchet to enable landscape support in the launcher”. There is a menu button in the drawer. Trebuchet settings –> General -> Auto-rotate screen and landscape mode should become usable. SDCard mounting: push /system/bin/vold from CM7 to your device and set the permissions to 777. Download Vold. Disclaimer: Follow this guide at your own risk. We at TechWalls will not be responsible if your device gets damaged or bricked during the process mentioned in this post. A rooted Kindle Fire with TWRP 2.0 recovery installed. 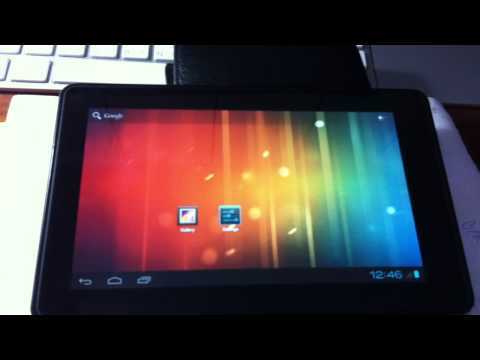 To get TWRP working, see our guide One Click Root, Recovery & Market Installation For Kindle Fire. 1. Download the Ice Cream Sandwich ROM (from the download link given above) and copy it to the root of your SD card. 2. Power off your Kindle Fire device, boot into recovery, power it back on and press the power button until TWRP recovery is loaded. 3. From the Backup section, create a new backup of your current system. Once done, simply return back to the Home Screen. Now, hit Install. 4. You will see the ROM on the right panel of the recovery window, Tap on it, select the “Flash” option to initiate the installation and simply follow the same method for Google Apps. 5. Once the installation is complete, restart your device. After the release of this raw build, it is quite likely that more improved ICS ports may come to light by other developers, which may provide a smoother functionality for end users. To keep yourself updated with new developments, functional/dysfunctional components of this ROM and for any queries, go to the XDA-Developers. First of all thanks for sharing your information….looking forward to your next articles…..